Miyamoto Musashi, 15th century author of The Book of Five Rings, was also a samurai, an expert and teacher of Japanese swordsmanship, and a painter. The Musashi Katana features a black iron tsuba of his design. The fullered blade is made from 7mm carbon steel. The black lacquer wooden saya (scabbard) has a speckled finish. The tsuka (handle) has real ray skin wrapped in black cord. 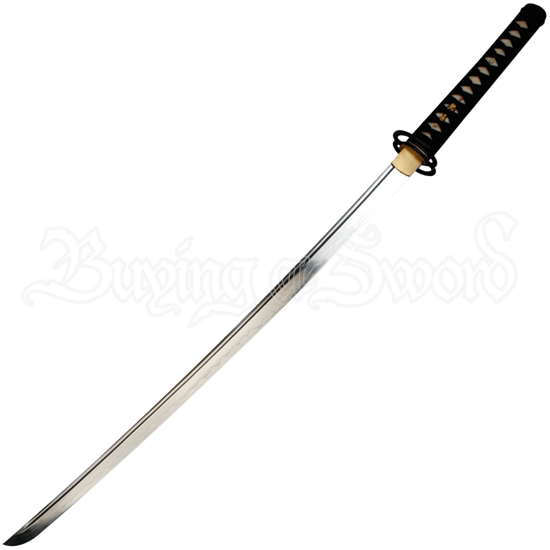 To keep this decorative katana in immaculate condition, a cleaning kit and a sword bag are included. This collectible katana pairs well with the Ten Ryu Musashi Wakizashi (MC-TR-005).